Consciousness is the basis of the human physiology. This central and profound reality of life is not considered in modern medicine. Only the knowledge of the relationship of consciousness to physiology, and the practical applications of this knowledge for diagnosis, treatment, and prevention, can significantly address the shortcomings of health care in the world today. The primary textbook of Maharishi School of Vedic Medicine is Human Physiology–Expression of Veda and the Vedic Literature by His Majesty Maharaja Nader Raam (a 600-page publication). This text, describes in detail the discovery of the precise correspondence between the structures and functions of the different branches of Vedic Literature and the structures and functions of the human physiology. 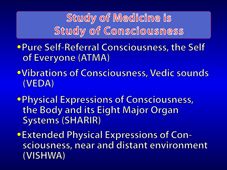 Based on the most recent research in physiology this discovery shows that the body is a precise expression of Total Natural Law—Veda and the Vedic Literature—and has its basis in consciousness. 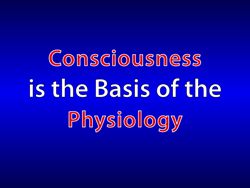 The conclusion is that consciousness is the basis of physiology. This historic discovery describes the physiology in terms of its inner intelligence, whose impulses manifest as the sounds of Veda and the Vedic Literature. Transcendental Meditation programme provides the direct experience of the field of pure intelligence, located at the source of thought, thereby enlivening the inner intelligence of the body. Maharishi Vedic Vibration Technology makes use of the sounds of Veda and Vedic Literature to enliven the inner intelligence of corresponding aspects of the physiology. Maharishi Vedic Sound Recitation programme is based on the listening to the authentic recitation of the segments of Vedic vibrations that create proper functioning in the part of the body with an imbalance, resulting in a deep and profound enlivenment of the body's inner intelligence.